Every year around the world there is celebration of the planets freshwater dolphin populations. More specifically, for WWF-Cambodia, this means a celebration of the Irrawaddy dolphin who lives in Mekong River between the town of Kratie and the boarder of Laos PDR. Running for four years, WWF-Cambodia has made 2017 the best year yet, bringing together almost 350 members of the local community, NGOs, and government to fight for the dolphin’s protection and look after its beautiful environment. With only 80 breeding adults left in Cambodia, and listed as ‘critically endangered’ on the IUCN red list of endangered species, community action is still vitally important. After a demonstration through Kraite town over 250 cycling enthusiast road 13kms following the Mekong river to the Kampi dolphin tourism site. Kampi tourism site is very significant as it is the location of the one of the Irrawaddy dolphin deep pools and is a crucial habitat for their survival. Following a blessing from the local pagoda for the event, an opening speech by WWF-Cambodia country director Seng Teak discussed the importance of the day and of collaboration with local authorities for dolphin protection, the threats facing dolphin populations, and what actions everyone can do to ensure its survival. Followed were speeches from the Director General of the Fisheries Administration, Eang Cheasan, and Provincial Governor declaring their commitment to dolphin protection and recognition of the economic importance they bring to Cambodia. After, the fun began with a quiz inviting participants to show off their knowledge of why dolphin protection is important and what people can do to protect the environment and a new billboard was unveiled at the tourism site dedicated to a hotline number that community members can use if they see any illegal activity or are concerned for the dolphin’s wellbeing. The event concluded with a ceremonial burning of all the illegal gillnets confiscated by the River Guard outpost this year and litter picking of the area to stop the rubbish contamination and pollution of the Mekong River and surrounding environment. 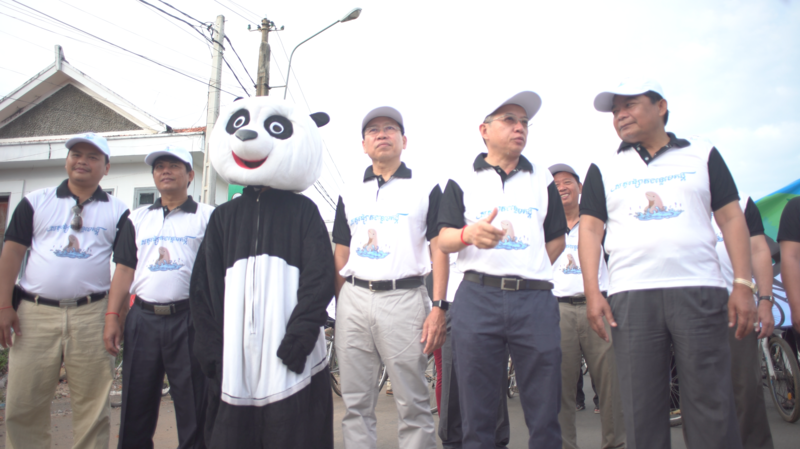 The aim of the Freshwater Dolphin Day event was to raise awareness of the importance that a healthy environment and proper waste manage can have, not only on the dolphin population, but on the lives of communities along to Mekong River too. Tourists who were visiting Kratie town also attended the event. Sabina Pavelkova from Italy said: “It’s a nice experience to see that people care enough to organise events like this. Giving back and contributing to a better environment is very important. If everyone does something we will see change. Next year WWF-Cambodia aims to make Freshwater Dolphin Day even better and with our vital supporters our conservation goals can be achieved and the Irrawaddy river dolphin in Cambodia can survive in the Mekong river for generations to come.